Have you ever had a mean, angry, or impure thought and beat yourself up about it, thinking that you are the worst person ever? Have you ever done a good deed, or had a brilliant idea and patted yourself on the back for it, thinking of yourself as better than the crowd of ordinary people out there? If so, welcome to the human race! We humans commonly think of ourselves as being evil or good depending on whether our thoughts, feelings, and actions are evil or good in our own judgment. The reason we think that way is that we don’t understand how things really work—or if we do, we don’t really believe it. Specifically, if we’re religious or spiritually oriented, we probably believe in our head that everything comes from God. But when it comes down to that great (or horrible) idea we just had, or that good (or evil) deed we just did, do we really believe it? Our natural tendency is to think that everything we think, feel, and do is our own. The reality is that nothing we have, nothing we are, nothing we think and feel, and nothing we say and do is actually ours. None of it even comes from us. Ultimately, it all does come from God. But before it gets to us, it is crowdsourced. All of our thoughts, feelings, motives, and attitudes come from the spiritual crowd that surrounds us all the time. 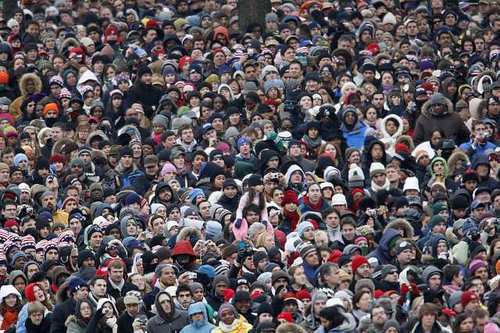 Crowdsourcing is modern name for a phenomenon that has been going on ever since there have been crowds of people. The term was coined in 2005 by two editors of Wired Magazine, Jeff Howe and Mark Robinson. The basic idea of crowdsourcing is that when a person or organization is looking for new ideas or wants to do some big or complex project that would be difficult to accomplish by themselves, they issue an open call to the world, usually via the Internet, asking for ideas, labor, or money. By putting it out to a large crowd of potentially interested people, they gain access to a large number of people, skills, ideas, and contributions that would otherwise not have been available. Police departments may ask the public for photos and videos taken as crimes unfolded in order to piece together a better picture of events, and search for evidence. Professional astronomers may ask amateur astronomy enthusiasts to search for particular celestial objects or events, such as comets, asteroids, or supernovas. In this ancient example, God crowdsourced the materials and building of God’s own sanctuary! In the true spirit of crowdsourcing, there was nothing compulsory about it. Instead, the offerings of materials and labor was to be gathered “from all whose hearts prompt them to give.” The result was a sacred space that was a freewill gift from the people to their God. That story of how God had the ancient Hebrews build the tabernacle says a lot about how God accomplishes things. You would think that God, being omnipotent, could just snap those divine fingers and the tabernacle would appear fully formed in a flash. Yes, God could do that. Instead, God works by an orderly, step-by-step process to bring new things into being. And when it comes to us human beings, although God does work on us directly from within, God also accomplishes many things for us through other human beings. Even being conceived as a new human being requires two people. And once we’re born, we’re cared for not only by parents, but by an extended family and community that become a part of our upbringing. As the saying goes, it takes a village to raise a child. If we were able to trace all of the people who cared for us, taught us, and influenced us in one way or another from our childhood onward, we would find that it is a crowd of people too large to count. That’s because God has created us human beings to live in community with other human beings, to take care of each other, teach one another, and love and serve one another in countless ways. If we spend any time at all thinking about it, we will realize and admit that without hundreds, thousands, and even millions of people contributing to our life in one way or another, we could not possibly be the person we are today. Physically, financially, intellectually, and socially, who we are does not come from ourselves. It comes from all the people who have ever done anything that affected us and contributed to our lives, either directly or indirectly. In light of this, can we really claim that our life is our own? Okay, maybe you’ll admit that you couldn’t live in this world if there weren’t millions of people who produced and delivered the food you eat, the clothes you wear, the building you live in, and so on. And maybe you’ll even admit that you have learned most of what you know from other people. But your thoughts and feelings . . . those are your own, aren’t they? We commonly think that we are alone in our own minds. Nobody else is in there with us, so how could we be anything but alone in our own thoughts and feelings? Yes, we can share them with others if we choose to. And if they’ve been through similar experiences, they may understand. But we’re still thinking and feeling them by ourselves within ourselves, aren’t we? From a spiritual perspective, the surprising answer to that question is: No. We’re not alone even in our thoughts and feelings. Just as our physical, financial, and social life is embedded in a vast community of people without whom we could not live, so our intellectual, emotional, and spiritual life is embedded in a vast community of angels and spirits without whom we could not have a single thought or feeling. Yes, I know. These days the idea that we are surrounded by angels and spirits who influence us is considered by most educated, scientific people to be an irrational relic of a superstitious past. 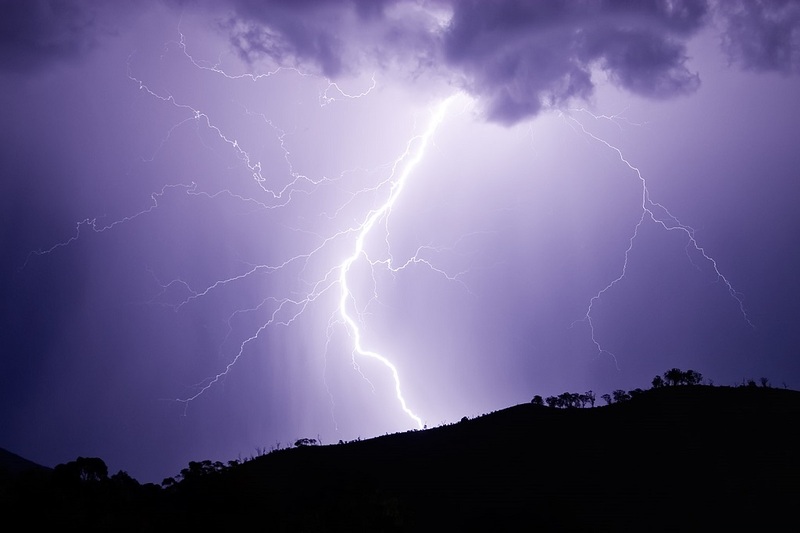 Most natural phenomena formerly attributed to gods and spirits—such as lightning, thunder, and the fertility of crops and livestock—have now been shown to be due to ordinary physical processes that are adequately explained by science without reference to the activities and intervention of gods or spirits. When it comes to physical phenomena, it’s best if we cede that ground to science. This material universe is not run by poltergeists who throw things here and there. But when it comes to the workings of the human mind, it’s a different story. Yes, science can tell us much about how the human brain works, and how that affects the workings of our mind. But the farther we travel up the ladder to abstract thinking and then to spiritual thoughts and feelings, the less science has to say about what makes us humans tick. That’s because at our deepest core, we are spiritual beings. This physical world is simply an external arena in which our spirit expresses itself. This means that as human beings, our native environment is not physical, but spiritual. That spiritual environment is populated by spiritual beings. In fact, the spiritual world in which our mind lives is teeming with angels and with spirits, both good and bad. Although we are not normally aware of it, our minds and hearts live in a spiritual community of thousands and millions of people who have moved on to the spiritual world. The most surprising result of this is that just as almost everything we have in this material world is produced for us by others, and only a tiny fraction of it by ourselves, so everything in the world of our minds and hearts comes to us from others. Only the tiniest fraction is our own contribution—and even that does not originate with us. The reality is that our thoughts and feelings exist in a vast spiritual community in which people’s thoughts and feelings freely flow from one person to another, and around the whole human community, just as goods and services flow freely among people, communities, and nations in the material-world economy. The reality is that we are not alone in our thoughts and feelings—no matter how much it may feel that way to us in our ordinary, earth-focused life. Instead, all of our thoughts and feelings flow into us every moment from the spiritual beings, both good and evil, who surround us in the spiritual environment where we are already living even while we are still inhabiting our physical bodies here on earth. That’s why John the Baptist said, “No one can receive anything except what has been given from heaven” (John 3:27). And as for the evil and false things that come into our minds and hearts, those, too, do not come from us. Instead, they come from the Devil (a collective term for hell), whom Jesus called “the father of lies” (John 8:44). According to Emanuel Swedenborg (1688–1772), if the angels and spirits who surround us all the time were to be withdrawn even a little bit, we would not be able to think and feel anything at all. That’s because our thoughts and feelings are not our own. They come to us from above . . . and below. Okay, what if all that is true? So what? What’s the difference? Here’s the difference: If all of our thoughts and feelings actually come from the angels and spirits with us—and ultimately from God, either via a direct or twisted path—then we can’t really take credit for anything we think, feel, or do, good or bad. Nothing in our spirit, mind, or body is truly our own. It all comes from a spiritual source outside of ourselves. How would it change our lives if we fully realized and accepted this? I have talked with angels about the connection between heaven and the human race, and have told them that religious people do say that everything good is from the Lord and that there are angels with us, but few people really believe that angels are so close to us, much less that they are in our thoughts and feelings. The angels have told me that they knew this kind of [empty] belief and talk occurred in the world, and especially (which astonished them) in the church, where people have the Bible that teaches them about heaven and its connection with them. Yet in fact the union is so vital that we could not think the least thought apart from the spirits who are with us. Our spiritual life depends on this. They said that the reason for this ignorance was that people believe they live on their own, without any connection with the Ultimate Reality of life. They do not know that there is this connection through the heavens. Yet if that connection were severed, we would instantly drop down dead. If we believed the way things really are, that everything good comes from the Lord and everything evil from hell, then we would not take credit for the good within us or blame for the evil. Whenever we thought or did anything good, we would focus on the Lord; and any evil that flowed in we would throw back into the hell it came from. But since we do not believe in any inflow from heaven or from hell, and therefore believe that everything we think and intend is in us and from us, we make the evil our own, and defile the good with our feeling that we deserve it. If nothing is ours, what are we? Does this mean that we are nothing at all? Compared to God, the answer is yes. God is everything, and we are nothing. But God thinks more of us than that. That’s why God has given us a sense of ourselves as unique individuals within a community of people and within the being of God. If nothing we have is ours, then what are we? We are containers and conduits to carry what is good, true, loving, and compassionate to the people and the world around us. 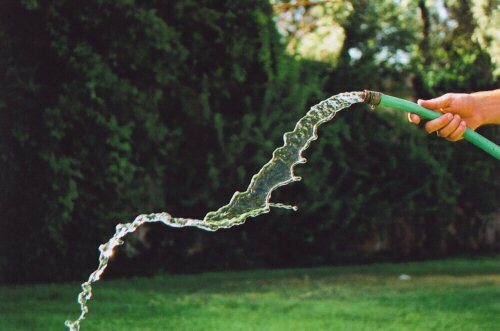 Think of yourself as a garden hose. The water that flows through you is not yours. It comes from the spigot (and beyond), and flows through you. Your job is to direct that water toward the plants and animals who need it to sustain their life. You are not the water. You are a channel or conduit to carry the water to others. Or think of yourself as a drinking cup. The water in the cup is not yours. You simply contain it. And we are a choice. That choice is whether to accept what flows into us from God and heaven, and express that in our lives, or to accept what flows into us from evil spirits and from hell, and express that in our lives. To use the image of the cup, you can turn your cup rightside-up, or you can turn it upside-down. If you turn your cup upward, it will be open to the water of wisdom and love that flows into you from above. If you set the cup down, no dust or dirt on the surface below it can get into the cup and contaminate the water. You will be able to offer a cool and refreshing drink of that that life-giving water to everyone around you. But if you turn your cup downward, all the good things flowing down to you from above will hit the bottom of the cup, run off the sides, and be lost to you. Instead of receiving life-giving water from above, you will be open only to the dust, dirt, and vermin of evil and false influences from below. Nothing we have and nothing we are comes from us, or is truly ours. Everything we have flows into us from above . . . or from below. There is no sense feeling guilty about the bad thoughts and desires that pop into our heads. They do not come from us. There is no sense in getting all egotistical about the good things we think and do. They are not ours. But we can refuse to accept and act upon the evil and false things that flow into us from below, and instead send them back to hell where they came from. And we can, in humility and innocence, express the good that flows into us from God and the angels by living a life of love, understanding, and service for our fellow human beings. ‹ Power Corrupts? Absolutely Not. Arrogance Corrupts Power. Thanks for an excellent description of the way in which our minds are dependent on the continual influx of thoughts and affections from the realm of spirit.